As such, Mayock’s baptism by fire as a real NFL general manager after nearly two decades as a TV GM was a resounding success. On the other hand, it simply is the price of doing business with a potential Hall of Fame player who is still one of the best receivers in the game, in his prime after leading the NFL with 15 touchdown catches last season and will be “a hungry and determined wide receiver to get back to his old ways of dominating,” according to Moss, now an ESPN NFL analyst. 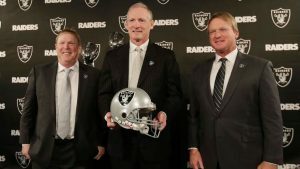 And don’t forget Brown being a member of a mutual admiration society with Raiders coach Jon Gruden and quarterback Derek Carr. Or how Brown, who has averaged 114 receptions for 1,524 yards and 11 touchdowns over the past six seasons, instantly upgrades the offense for a franchise that never had a player hit those marks in catches or receiving yards in a single season. Next Post: Browns all-in for Super Bowl after trading for Odell Beckham Jr.